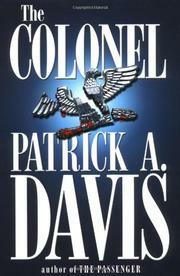 Behind an unusually vicious Beltway triple murder lurk Davis’s trademark military-industrial conspiracies and cover-ups. Whoever killed Air Force Col. Margaret Wildman, a Pentagon aircraft maintenance specialist, really wanted her dead: she was brutally beaten before her throat was cut. What gives the murder particular ferocity, though, is the killing of her two preteen children, presumably right before her eyes. The method of killing is the key to the mystery surrounding Wildman’s death, infuriatingly oracular Arlington County homicide investigator Lt. Simon Santos tells Martin Collins, the retired Air Force officer who’s been pulled off his small-town police chief job to consult on another military homicide. After all, why didn’t the perp wait till Wildman’s children were at school to waylay her—especially since the motive was patently her suspicions about the safety of the Global 626 airliner, which had a dangerously unsatisfactory (and well-concealed) track record even before the Air Force tested the plane several years ago? The quest for an answer will take Collins, Santos, and Air Force investigator Amanda Gardner (a fifth wheel who seems to have been added only to cut the testosterone factor and spark movie-studio interest) from Wildman’s explosive ex to her gossip-columnist best friend to a menacing pair of feds to a high-handed Air Force security chief with troubling links to Global’s octopus to the higher-ups found along all the usual corridors of power. Miraculously, the hard-working, convoluted plot will reveal that they’re all involved, along with others too numerous to list; unfortunately, they’re all such two-dimensional types that it’s hard to keep track of who’s suspended whom from which investigation or confiscated which incriminating computer disk, let alone care very much about the outcome. His third high-powered, conscientious outing confirms that Davis (The Passenger, 1999, etc.) delivers the goods—as long as you don’t prefer Godiva chocolates to Raisinets.